Combine social democracy, an increased availability of low-cost materials, and new methods for mass production and what do you get? One of our favorite styles for 2017- Scandinavian Design! Emerging in the 1950s in the Nordic countries (Finland, Norway, Sweden, Iceland, and Denmark), Scandinavian design is based on the idea that beautiful and functional everyday items should be affordable for everyone. This created a style characterized by simplicity, minimalism, and functionality. It became a massive influence on the mid-century modern design movement in 1950’s America. If you’re a Mad Men fan, then you should be quite familiar with this design style. It was featured heavily throughout the set design of the hit drama series. Can you picture a suave Don Draper in his office at Sterling Cooper Draper Pryce or enjoying a martini and cigarette in his handsome Upper East Side apartment? Think sleek, clean lines paired with organic materials and minimal accessories. It’s fuss free sophistication. Want to incorporate the Scandinavian aesthetic into your home or office design? Here are some of Henck Design’s favorite Scandinavian design elements that you can utilize to create a beautiful and functional Scandinavian inspired space. A neutral color palette is a staple in Scandinavian design. Crisp white walls transitioning into white hardwood floors help open up your space while creating a bright and effortlessly modern feel. If the all-white aesthetic seems stark to you, opt for a cool grey wall or a light natural wood floor instead. Despite the emphasis on muted neutrals, don’t be scared to play with color! Bold pops of color can be a powerful addition to a room. 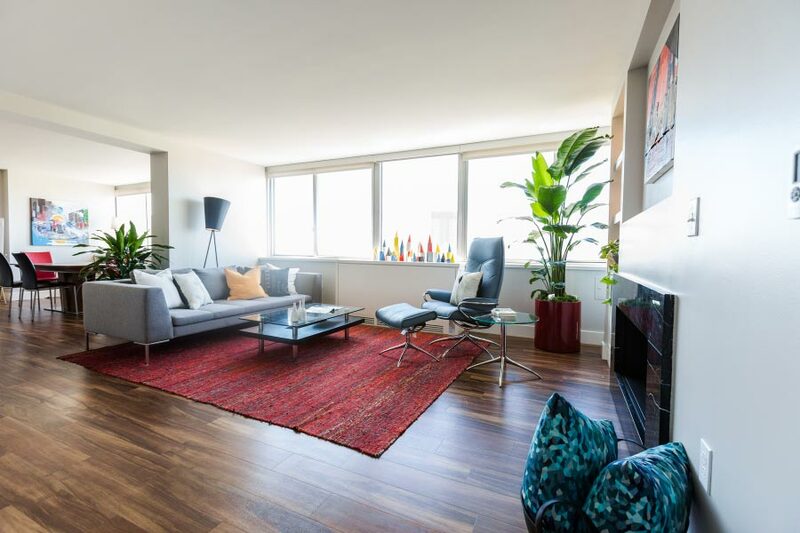 Contrast those neutrals with a vibrant blue accent wall or be daring with striking furniture and rugs to add a funky, modern layer to your space while maintaining that Scandinavian feel. We couldn’t think of a better excuse to buy a fluorescent orange couch! When it comes to furnishings, make “form and function” your mantra. Quality crafted walnut tables with tapered legs, funky yet comfortable lounge chairs, and low-hanging geometric lights bring a sleek and organic warmth to your space. Remember: everything is about purpose. Bright lighting is a must, so get rid of heavy window treatments to let in maximum natural sunlight. If you’re buying new construction, try to work with your builder to add in skylights or large windows. Bring in both nature and color with fresh green plants. Keep that vibrancy alive and remove indoor air toxins by adding some of our Feng Shui favorites like bamboo palm or Boston fern. 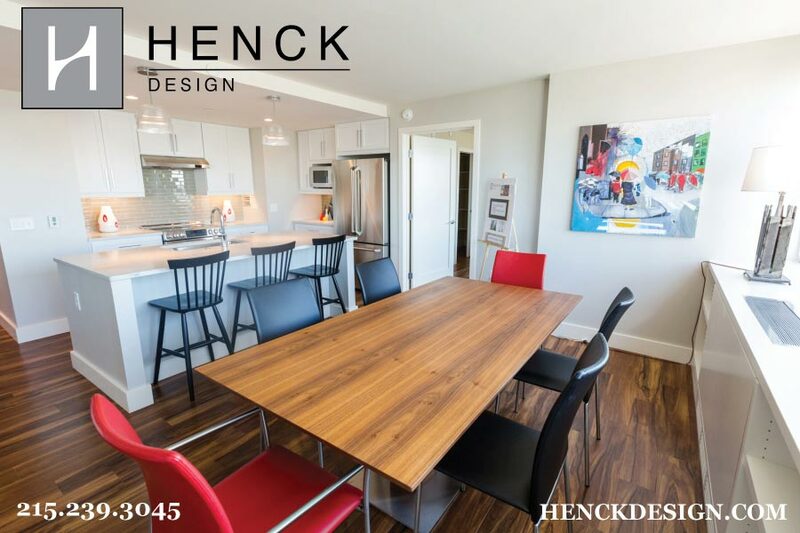 At Henck Design, we believe that how you design your space can define your life. Time and time again, Nordic countries rank at the top of the world’s happiest countries (with Norway, Denmark, and Iceland claiming the top 3 spots in 2017!). Obviously interior design isn’t the only factor responsible for this…but if you’re trying to make a positive change in your life then implementing this simple, modern style into your home couldn’t hurt! Still looking for inspiration to bring elements of Scandinavian design into your space? Check out the Henck Design “So Scandinavian” Houzz Ideabook and Pinterest board. Your home will be So Scandinavian in no time! 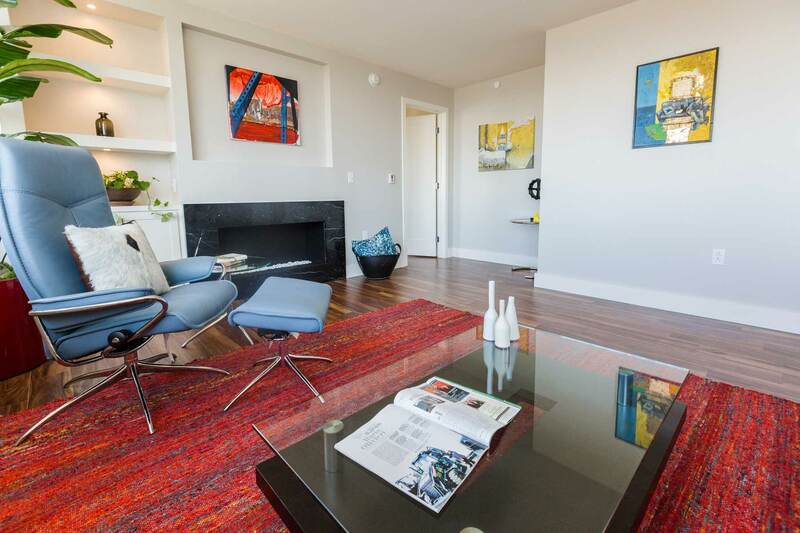 At Henck Design we help clients conceptualize & implement their design styles into their home. If you need help integrating this modern, minimalist style into your home, contact us for more info.